A New Britain Police Officer is bringing his community together one dance move at a time. 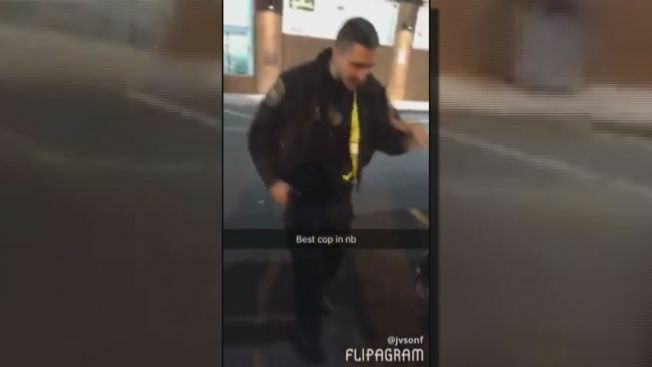 The video of the dancing police officer has gotten millions of views on social media. The grooving patrolman in the cruiser is Matthew Sulek, a New Britain officer for two and half years and a policeman for more than four years. Sulek has only been a social media sensation for a little more than three days. "They immediately turned (the music) right down. I noticed that they did that and I said, 'No way man turn that back up. Let's just enjoy life with each other!'" said Sulek. Sulek said while driving through a Walgreens parking lot early over the weekend around midnight, he discovered a group of teens jamming to music by rapper, Future. The 26-year-old officer wasn't about to stop the fun. "We've gotten such a bad rap, it's good to show positivity," said Sulek about police officers. The video of the dancing officer has gotten more than 3.6 million views. And this isn't the first viral video starring the late night patrolman. Last year, another video of Sulek dancing with a teen reached millions on Facebook too. "We're human and that's what makes us who we are," said Sulek. Sulek said the best part of the dance-off is what the kids told him at the end of the video. "That just goes to prove that all cops are not the same," said one of the teens in the video. And what the teens shared when the camera stopped recording. "I found that two of them want to be a police officer," said Sulek. The officer said if dancing helps his community come together, then please. Don't stop the music. "There's way of being a cop and there's way of being a police officer, that's how to be a police officer." said Sulek.